I had contacted Terence to inquire about pricing for two copper planter box liners. In a very short period of time, he got back to me with a proposal. The pricing was fair and I received my beautiful custom liners by the promised delivery date. When I received the items I was very impressed with the quality of the liners. I will definitely be contacting Terence in the future for all my custom fabrication needs! 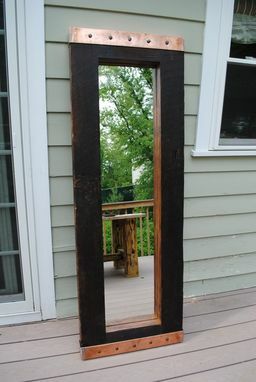 Bold reclaimed wood framed full length mirror makes a statement with its copper accents. The wood has all the character and beauty of its age. It was reclaimed from New York's Hudson Valley Industrial Revolution era. It measures 69" tall, 24" wide and 3" thick. The mirror glass is 1/4" thick and the accents are made with 16 ounce copper. Every maker has a story. Be a part of Reclaimed State's story by placing an order, leaving a review, and seeing your review appear here.